A very catchy heavily rhythmic book that explains all the different attributes of kids. There are many books that show babies doing simple activities, with simple descriptions, but most are boring. This book is different. It is a pleasure to reread. My favorite alphabet book of all time. For each letter, say H, we have a great illustration that goes with text: 'Horrible Hairy Hogs Hurrying Homewards on Heavily Harnessed Horses.' Imagine a picture that goes with this and you will understand this book. A clever rhyming book that introduces all of the basic shapes in an interesting way. A young boy's family adopts a stray dog. The boy tries to figure out why no one wanted his wonderful dog. Touching. A little girl has adventures with her grandfather. Towards the end of the book, Granpa gets sick stays in his chair. The last page shows the chair empty. 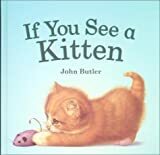 A cute book for a really young toddler, or infant. It goes over the different sounds one should make when observing different animals, like when you see a kitten, say 'ah.' The ending is pretty funny. Ten little animals play hide and seek in the meadow. It is fun to read this book to a tune. The pictures are done so that the animals look like live stuffed-animals, very soft and cuddly. I have read this book around 100 times and I am not bored yet. This unique picture book tries to explain to a very young audience the importance of dreaming up ideas. A nice story about a mean and scary looking fish who has a big heart. Poor Big Al, all he wants to do is make some friends. But all he succeeds in doing is to scare away all of the little fish. Of course, as in many stories, he doesn't succeed in gaining the little fishes' trust until he saves them from harm. The pictures are amazing and really add to the story. It teaches a good lesson: don't judge people by the way they look. Farmer Brown's cows demand electric blankets (they are cold at night) and when they don't get them, they go on strike. Very witty. Baby Llama is back and this time they are off to the Shop-O-Rama. 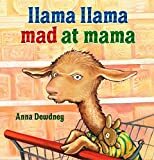 Baby Llama gets a little tired of sitting in a shopping cart, and starts trowing a tantrum (a Llama Drama). Your two year old will love this book. 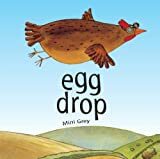 This is a great, simple, rhyming book that will sound fresh even after reading it many, many times. The rhythm is clever and catchy. Baby Llama is in bed, and he wants his Momma. 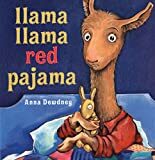 When she doesn't come fast enough, he gets scared and starts yelling (a Llama Drama). It is a perfect book for a two year old. A little egg dreams of flying. A funny and clever take on the old Humpty Dumpty rhyme. Beautiful book about a Russian orphan whom no one wanted. Finally a couple from America adopt him. Based on a true story. This book is made up of one poem, with superb, soft pictures. If the poem and pictures were separated, each, on its own, would stand well. But together they are much, much more than a sum of their parts. I have read this book roughly one hundred times and I am not yet sick of it. I received books two and three as gifts and never thought much of them. But when I received the first Fancy Nancy book I started to see what all the fuss was about. Nancy does use fancy words, and it does get a little annoying when she defines them. I guess you are supposed to skip the definitions, though I like to read them in a baby-portentous voice. This powerful wordless picture book teaches the futility of war to an absurdly young child. A frog sits on a rock, enjoying a flower he picked. A mouse comes up from a hole and sees the frog. Even though there are plenty of other flowers around, he steals the frog's flower and takes his rock. Slowly the fight builds in intensity when more people get involved, and before long there is full blown war. Popov's inspiration comes from his first hand experience as a World War Two child. There are no words, so you and your child will have to construct the narrative. Hilarious illustrations that go with a simple story about a boy who doesn't always behave nicely. Based on the 1879 discovery of ceiling paintings in Altamira Cave (Spain), a young girl discovers cave paintings that are roughly 10,000 years old. The book's stunning artwork is based on the actual cave paintings. 'When you are sad, I will hold you. I will let you cry. I will catch your tears in a blue cup and water the yellow flowers and they will grow more beautiful.' A delightful poem, with wildly imaginative pictures, that tells how a parent responds to a child's various emotions. 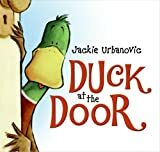 A wonderful book that can be enjoyed by toddlers, adults, and everyone in-between. A little girl misses her unspecified parent/grand parent and sends herself in a letter. The book is written and illustrated in the style of a child's work, but though the verse is simply written, it is quite good. This book contains clever pictures that are full of optical illusions. 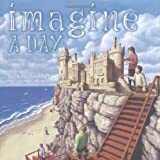 For example, imagine a picture of a sand castle. When looked at from one side, it looks like a regular sand castle. But on the other side, because of how the perspective is rendered, it looks like a full size castle. The idea is that the child builds the small sand castle and imagines it is real. Duck comes to stay in an animal loving, warm home. '...Suddenly the wind came up. It blew the clouds and rain away. 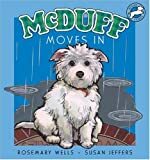 And the moon smiled full on the world...' McDuff is a stray dog who escaped from the pound. For the first time in his life, he meets someone who is nice to him. The book is simple, but sophisticated. 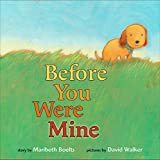 Wells's books are great for really young children (they mostly have only a few lines of text per page) but they are also entertaining for the adult reader. This is the first book in a series, but I like this one the best. A catchy rhythmic poem that tells the tail (pun intended) of a middle mouse-child. You will enjoy reading this book many, many times. Peobody is a little stuffed, toy rabbit who becomes real when he is loved. Basically, the story is a simple variation of The Velveteen Rabbit, suitable for really young listeners. A little boy (actually a mouse) is very shy. The story shows how the parents, unsuccessfully, try to force him to be more social. As in most of Wells's books, the text is a clever rhyming poem. A heavily rhythmic text about a bunch of animals who get stuck in bubble gum. A funny, rhyming version of sleeping beauty. The prince does everything except kiss the sleeping beauty. A collection of simply rhyming poems by various poets. The illustrations are simple, suitable for young children. The nice thing about good poems is that the adult will almost never tire of reading them (assuming, of course, that the adult likes poems).